I was able to swim on Tuesday and Wednesday, so that is good for me. I was afraid I would not get any pool time in this week because of the clouds. It is actually a good day to swim today also, but I had a lot to do. I was thinking it was going to rain also, but so far no. I took Josh to the high school to pick up his schedule and pick out his locker, then we went to the bank to cash a check he got for his birthday. We came home and I called the lady who helps us at the preschool. She is the church connection that gets us stuff. Anyway, I had made a list of things for her of things we need and she is wanting to meet with me tomorrow because she has the stuff I asked for. She has the kids' snacks and a lot of supplies. The great thing is the church had already dropped off some supplies, so we are going to be set. I am excited about that. I am still not ready for school to start, but we are prepared. Then Josh and I went to get our haircut. So we both have our hair taken care of for back to school. I am meeting my friend Malinda tonight and we are going to an essential oils party, this one is for Autism/ADHD, it will be a good one for the classroom and knowing what oils to use in the classroom. We use the Young Living essential oils. There is a Back to School class coming up I am more interested in for Josh, but this one is first. Ok, so for Throwback Thursday, I am posting this crazy picture I found in my files when I was hunting pictures for Josh's birthday collage. Some of you may remember it. 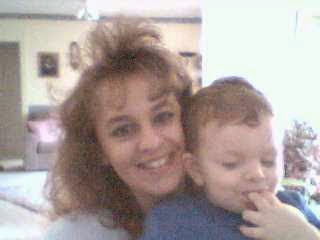 It is from when I first came online with my website, so Josh was maybe a year or 2 and I was about 28. I wish I was this skinny still. Oh well. Have a great week!! Here is my siggie from Judy. This siggie is so me in the summer. Oh how I hate that summer is almost over. What a sweet photo. They grow up way to fast. That is an adorable photo. But 16? Sheesh. That's hard to believe. I love essential oils Lori! They're so good for many things. I'm glad you got to swim this week. When do you put the pool away? Such a cute photo! I have used essential oils too. I love the lavender! Have a great day! Oh Lori, what a precious photo of you and Josh! Honestly, it is in the blink of an eye, and they are all grown! Glad you got to go swimming. We are invited tomorrow to a cookout at our nephews, and there will be swimming! I can't wait!! Hugs! Hi Lori, Love the photo! I hate that summer is almost over too! Happy w/e. Hugz!